The Danish have an expression for it: ‘never dress yourself in another bird’s feathers’. I think I’ve got that right. Anyway the principle remains true – don’t nick another person’s work or ideas. I like this; particularly because I once (unintentionally) carried out this heinous act, or perhaps it would be best to say that other people thought I had. I was reminded about this today because it’s BBC’s 6 Music’s ‘Wear Your Old Band T-shirt To Work Day’ and I used to print T-shirts. It was hardly a mega-business, in fact it was just a way for me to pursue my interest in screen printing by flogging a few to classmates. It was hard to get Stackridge T-shirts at that time, especially featuring Marzo Plod! 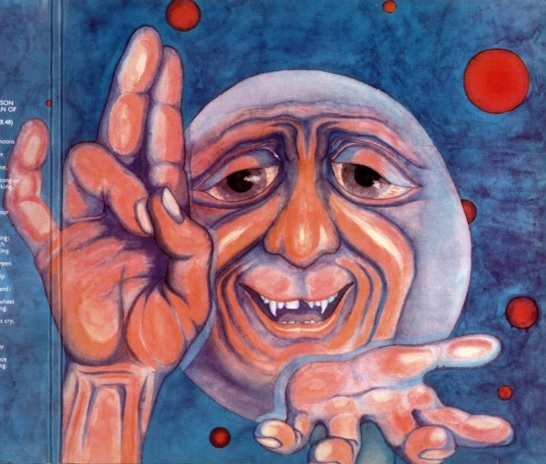 One of the most popular I produced was of ‘The Crimson King’ – he was the character inside King Crimson’s debut album gatefold sleeve (heady days). Everybody loved this guy (painted by one Barry Godber, a computer programmer who died tragically young shortly after the album was produced). The Crimson King by Barry Godber – not by me! I never said that! Even my art teacher liked it – very nice lady but a little ‘old school’ which was ironic as I went to a very new school’. What I didn’t know at the time was that she had thought I’d created the image, not simply nicked it to stick on a T-shirt. I mean, everybody knew King Crimson, right? It’s worse when you’re writing comedy, because you hear and make up gags all the time and they get stuck in some spare synapses until at some point you want to use them and you think to yourself: ‘is that mine?’ There’s one great line I’m desperate to use, but I’m convinced it’s not mine, although I can find not trace online and nobody I mention it to has ever heard if before. So, please, if you ever read or hear anything of mine that you think belongs on a ‘different bird’, I assure you it’s not intentional! And this one’s for Barry Godber, I still love your painting. Sadly I lost the last T-shirt years ago.